Laptop screen glowing, my clock reading a quarter to midnight, and the Tagalog language flowing from my speakers at a rate I can barely keep up with... Why yes, it's another night of me and my personal YouTube marathons past my bedtime. This time, I'm watching Pinas Sarap—a series of mini Filipino food documentaries—and to no surprise, I learned about several types of pancit I’ve never heard of. If you remember my “Pancit Molo for Your Lolo” piece, I learned that pancit isn’t just an aluminum tray filled with noodles, vegetables, and meat at a family party. In fact, it’s most popularly known as Filipino noodles, and the word itself comes from the Hokkien Chinese word “pian e sit” meaning “something conveniently cooked.” Yup! Another food brought over by 10th century trade... Though, may I stress the fact that they are Filipino noodles and not the name of a dish? Up until recently, I thought that “pancit” was the name of a dish that was cooked in the same exact way except with noodle changes. Little did I know that it could be cooked in more than 50 ways throughout the Philippines. Pictured above, are common types of pancit found in many Asian grocery stores and Filipino dishes. Luglug: Cornstarch noodles. Pancit luglug noodles are rice noodles. Canton: Dried, long egg noodles. The fresh version is called "miki." So why have I only known of a couple variations of pancit? This is also one of the reasons why 'what makes Filipino food, Filipino food?' makes for an impossible question to answer and a very limited conversation, especially in the States. The Philippines 7,000+ island geography makes Filipino cuisine uniquely regional and extremely complex, and pancit is one of the beautiful examples of how Filipinos have taken a product of trade and have truly made it their own. I think it's up to us to explore and embrace all of cuisines the Philippines has to offer and not define it by a select few dishes. In an effort to learn more about the beauty and diversity of the Philippines and Filipino food, I’ve decided to create a four-part pancit series with research and documentation of dishes beyond canton and bihon guisado. Hopefully through this, we’ll learn something new, get inspired and hungry, and have something to refer to when we want to cook something. If you're interested in creating any dish that I've listed in this series but aren't familiar with Tagalog, feel free to reach out to me and I'll be happy to translate! Filipino food is for everyone. According to Felice Sta. Maria, a well-known Filipino food historian, Filipino sauces didn't exist up until recently; they are sophisticated and complex to make, and in the late 1800s, the Philippines' stage in development for cooking was in the foundations of boiling. In the past, if you heard the term "sauce" it most likely referred to a type of salsa, sawsawan (dip), broth, or ingredient like fish sauce and soy sauce. I've categorized the dishes below as noodles with a thick liquid added on or to them to season and flavor. This dish is this blog post's main image. 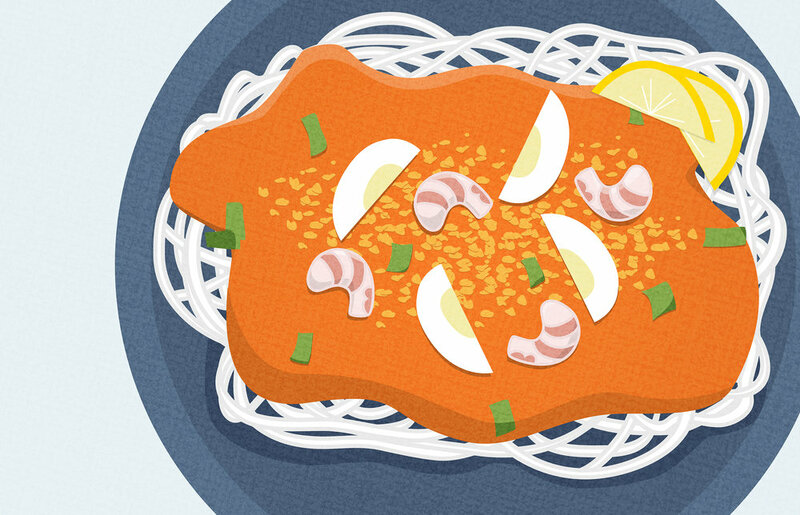 It's made up of bihon noodles and is topped with thick shrimp sauce, chicharron, boiled egg slices, calamansi juice, and tinapa (smoked fish) flakes. I want to highlight that each dish can be tweaked according to which province we're in. For example, pancit ng Bataan is palabok with tons of tinapa since tinapa is known as one of Bataan's best products. You can learn more about this ingredient here and make some at home with this how-to. "Luglug" comes from the Tagalog word "ilublob," which means "to dip." This cooking method requires cooks to dip noodles into boiling water for fast cooking. Pancit luglug is similar to palabok but is saucier, can sometimes have thicker noodles, and its own cooking method. Note: Palabok noodles are used for this dish instead of luglug noodles. The pancit malabon that many know today looks very similar to palabok; however, it wasn't always that way. Malabon's name comes from the words "maraming labong," meaning "many bamboo shoots," and the original recipe from the 1800s had bamboo shoots in place of thick rice noodles. The dish later evolved in the 1900s to include the previously mentioned rice noodles and later gained its signature orange sauce in the 1940s. Pancit malabon often includes a variety of seafood toppings (such as squid, shrimp, milkfish, mussels, and oysters) since it comes from the fishing epicenter of Manila. "Sabaw" means "broth" and "pancit sabaw" is the general term I've linked to noodle dishes that aren't as wet as a soup but not as dry as a stir fry. Pancit batil patung is a heap of miki noodles that's been cooked with carabeef (carabao beef) in a rich brown stock, has plenty of toppings, and has a poached egg placed on top. The dish's name literally translates to "beat the egg and place on top" and it comes with a beaten egg broth and a dip consisting of chopped onions, soy sauce, bird chili, and calamansi. If you're interested in cooking this at home, check out this step-by-step. If you just need more reasons to salivate, take a look at these noodle mountains. Isabela is a neighboring province to Cagayan and has a similar dish to pancit batil patung. What differentiates the two dishes is that the people of Cabagan use a mixture of pork and often top their dish with quail eggs. The mixture of pork includes ingredients such as lechon de carajay (smoked pork roast), lechon kawali (crispy deep fried pork), and igado (porks style ragout). This dish is a Jose Rizal (a Philippine National Hero) favorite, which he writes about in his novel, El Filibusterismo. Langlang is a vegetable-topped pancit that is often cooked using three types of noodles: miki, canton, and sotanghon. Back in the day, it also included tengang daga (rat's ear), mushrooms, dried shrimps, boiled chicken, and fresh coconut trunk piths. It has a soupy/wet consistency—hence the shallow serving bowl. Pancit alanganin and pancit bakla have a mix of miki and bihon noodles, stand between a guisado (stir fry) and mami (noodle soup), and contain patola (luffa—a climbing plant of the cucumber family). The difference between the two is that pancit bakla is has milk in its sabaw. A couple of delicious updates here and there. The only spam I like is the one from the can. No other spam here.